November 25th - Back on Top! 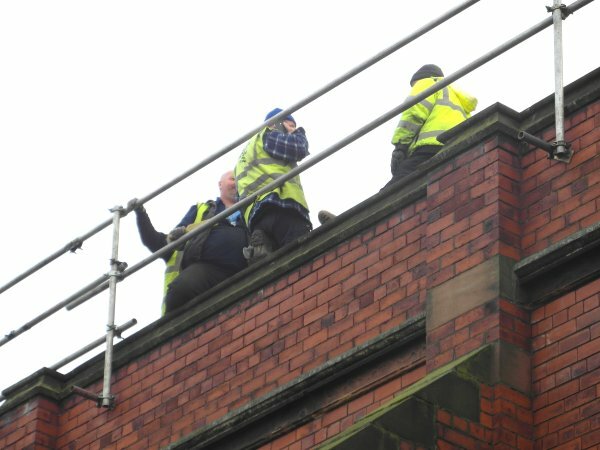 At the PCC on Wednesday 12th November, we were in a position to make a resolution, passed unanimously, to proceed with repairs to the North Roof. This is because the numbers do now stack up, and we can afford both to repair the roof, and to maintain our commitment, as an Anglican Church, to support ministry and mission through Parish Share. This is because the finance for the roof comes from the astonishingly generous offer of an interest-free loan of £20,000 from a member of the congregation who wishes to remain anonymous. The Parish needs the discipline of repaying the loan, but as it is repaid, a proportion of it will be tithed back to the Parish as planned giving. The PCC unanimously accepted this offer, and proposed a Vote of Thanks to the anonymous congregation member. With the help of the Archdeacon, the Interim Order (i.e. the legal permission for the work to be done) is now in place, and it will start on Tuesday 25th November. As the three pictures above show, work did indeed start on 25th November, carried out by BBR Roofing and bringing towards an end the saga of the roof. Before long this page will be consigned to the archives! 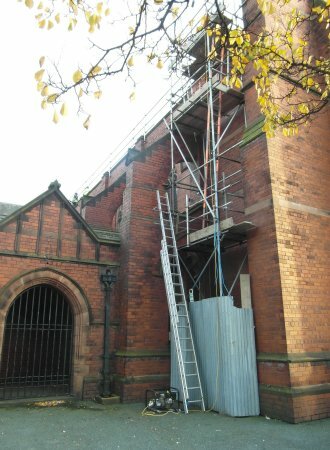 On Friday, the Church suffered another incident of criminal damage to the roof, this time to the North (Kingsway) side. We know it happened within a very small time window; the alarm has been off during the day whilst we have been expecting contractors to the site. I was at Stanfield School taking assembly on Friday morning, and it had not happened when I walked back at 11-30am. The gardener was working in the Memorial Garden and alerted me at 4pm. It is criminal damage this time and not theft because the gardener and I found the lead from the roof hidden in the bushes by the boundary wall. It is now under lock and key, as is the trolley the perpetrators used. Ecclesiastical, our insurers, have been informed. BBR, our excellent contractors who have been working on the South roof, were called out by Robbie Bell our Architect and a temporary repair was done on Saturday morning. This does not make us 100% watertight but it affords some protection. I have also asked Robbie Bell to get BBR to quote for the full repair. I informed the Wardens and Treasurer immediately, closely followed by the Standing Committee and PCC, and then the Archdeacon, as is our obligation. Once we have specifications for the repairs in, the Standing Committee and then PCC will meet to decide how to proceed. 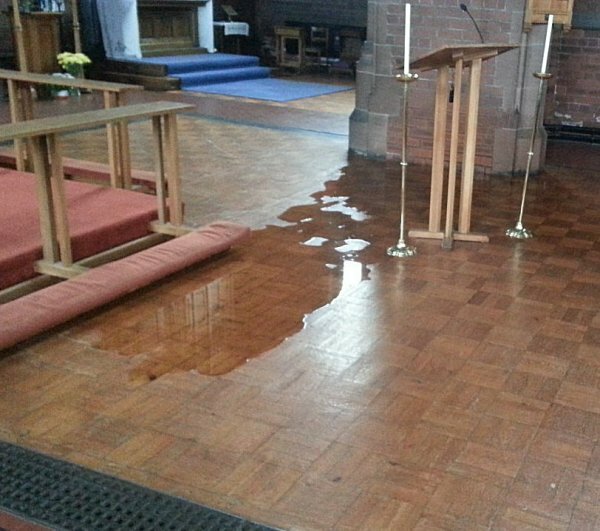 I am gutted myself about this – it is a blow, just as St Faith’s was beginning, in so many ways, to recover. However, we have shown already we can get major repairs to the building done; this is a random, if well-planned, criminal act, and the important thing is what happens now. So I am asking you to dig deep spiritually and to remember we continue to be God’s holy people in this place - so let us enjoy the patronal, and go on living out our calling – worshipping God in celebrating the Sacraments, saying our prayers, loving God and loving one another and our neighbours. I’d like to pay tribute to the Wardens, who have done just that, as well as pitching in immediately in practical ways. We will of course keep you fully in the picture just as soon as we know – through bulletins like this, announcements, and in due course the website. Do please contact me personally if you would like to ask anything at all. September 26th: no more Singing in the Rain! As this is being written, the repair to the high roof is now complete and there are pictures elsewhere in the magazine to prove it! Our Architect, Robbie Bell, inspected the work (and took the piccies) and has pronounced it a text book job – and quite possibly better than what was there before. The work on the porch has now begun and there is more scaffolding up. – which is unconnected with the theft – to be done. Robbie continues to keep an expert eye on all this work for us. The ‘slates fund’ stands at just under £10,000 – a phenomenal amount of generosity and effort from the people of St Faith’s. With the insurance payout of £5,000, that gives us £15,000 – we are on our way, in other words. – but things are looking very much better than they were a couple of months ago. A huge thanks to all for your generosity, commitment and enthusiasm – we are indeed raising the roof! 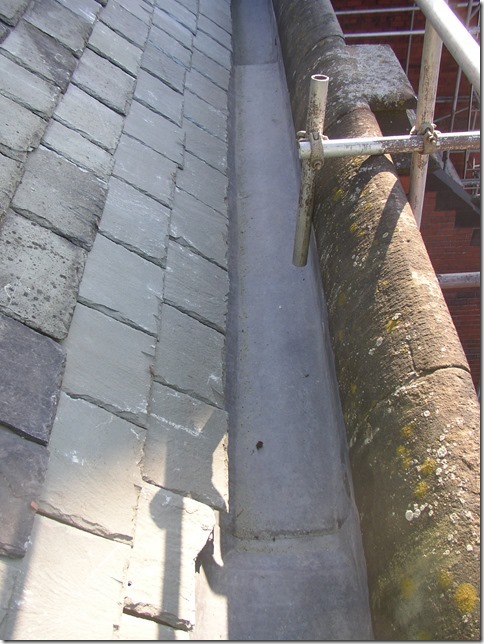 By September 10th, the damage done to the high north roof had been expertly repaired and re-leaded, as architect Robbie Bell's photos demonstrate. A sophisticated roof alarm system has been fitted and is in operation, so that anything larger than a very fat pigeon setting foot on the roof will broadcast its presence to Crosby at large. Work is continuing on the porch roof (see above). The Raise the Roof Appeal is making good progress. We have already raised just under £10,000 - a wonderful effort. With £5,000 from the insurance, we still need to raise another £10,000. All contributions very welcome . Pplease make cheques payable to 'PCC St Faith Great Crosby' and send to our Treasurer, David Jones, marking the envelope 'roof fund'. Don't forget to Gift Aid your donation if you are a taxpayer. David's address is on the DIRECTORY page of this site. Thank you to all our friends! I write this as work is about to start on the permanent repair on Tuesday 26th August. The temporary repair has been very good – it has largely held and kept us watertight but we now need to get the work done properly before the winter sets in. The quality of the temporary repair as well as our Architect Robbie Bell’s involvement gives us confidence that our contractors will do a very high quality job. The work on the roof alarm will begin on the same day. These have proved to be a very effective deterrent to thieves in other churches up and down the Diocese and elsewhere. 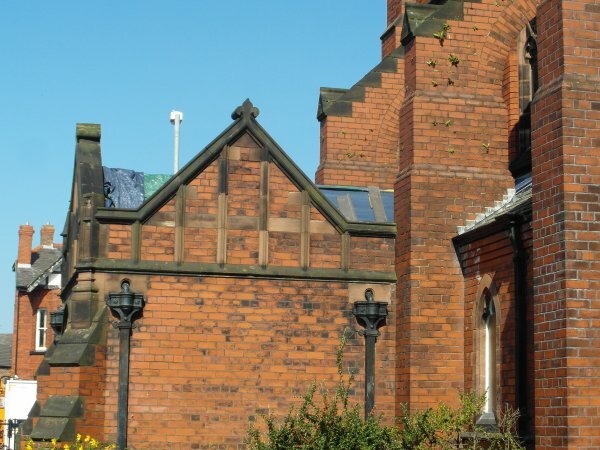 Basically, if thieves try again, with the roof alarm, most of Crosby (and the Vicar and Wardens who are the designated ‘to be called’) will know very quickly – within minutes! The alarm will be installed and operational from the first day of the repair. The work on the roof itself will take 2-3 weeks. None of this comes cheap! The total bill comes to just under £27,000. However we have already raised just over £6,000 – without even formally launching an appeal, and with the £5,000 from the insurance payment, we are already over a third of the way there. Some of the money raised is from effort – people giving freely of their time, talents and energy, and some of it is from people directly giving –equally freely and generously – of their money. It is a huge testament to St Faith’s that we have come so far in a short time. Given this, we are now cautious but hopeful that we will be able to raise the money without resorting to a loan, whilst still being able to continue our commitment to Parish Share. This is a huge achievement! 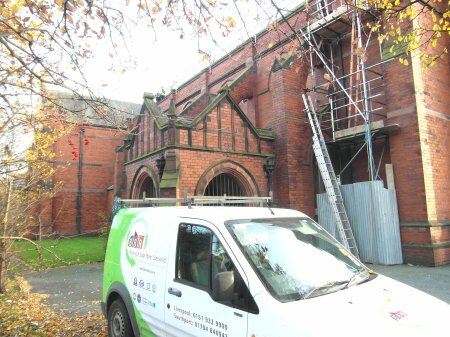 We are hoping also that the less urgent but still necessary repair to the roof over the organ loft can be done at the same time – and this should enable us to save some money on it. Meanwhile, the arched window over the Milton Road entrance to the Hall blew out of its frame in the storms on the night of Sunday 10th-Monday 11th August. Robbie Bell came to the rescue again, and a reliable local contractor is doing the work. A ‘make safe’ should happen within days, and get us open, and a replacement window in a short time. Sometimes, it’s like this in our own homes – one fabric issue after another! But the satisfying thing is seeing the work done and the buildings restored. It has shown that we are up for buildings projects – though perhaps we’d rather not have found out in this way! We are lucky to have committed and hardworking wardens who have been involved at every stage in this process. 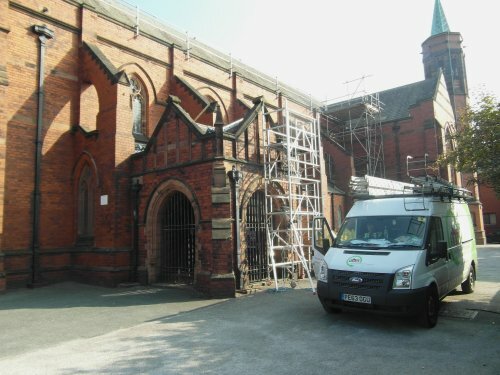 On the very day the lead was stolen from the roof, the PCC began to consider ways to give proper kitchen facilities, loos and a more open and welcoming entrance at the West end of the Church. So – coming soon! – an outline of what we hope for, as we seek to make this holy house a place of prayer for God’s people and of welcome and hospitality for all our neighbours for another 100 years or so – and beyond! The permanent repair work and fitting of the roof alarm system is scheduled to begin on 26th August. It shouldn't cause any disruption inside the church itself. The 'slates fund' stands at just over £4,100, thanks to the great generosity of St Faith's people. We have also received our insurance payout of £5,000. 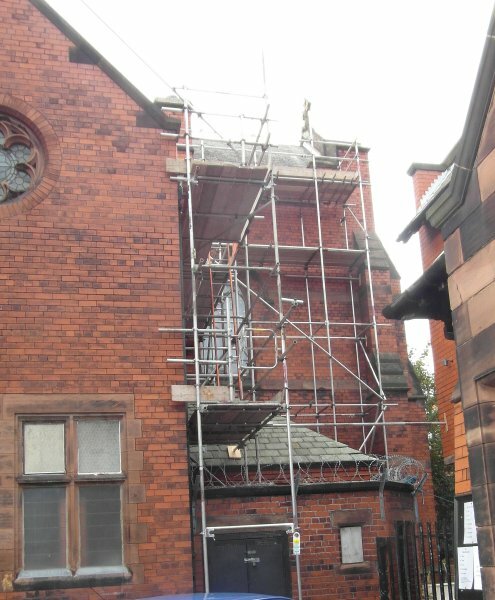 Next week will see the launch of the 'Raise the Roof' campaign, seeking to raise the money we still need, and, we hope, to give us some 'seed capital' to apply for grants to improvements at the back of church. Rick Walker's attractive small plaques made from the damaged slates are still on sale at the back of church, for a suggested donation of at least £5. 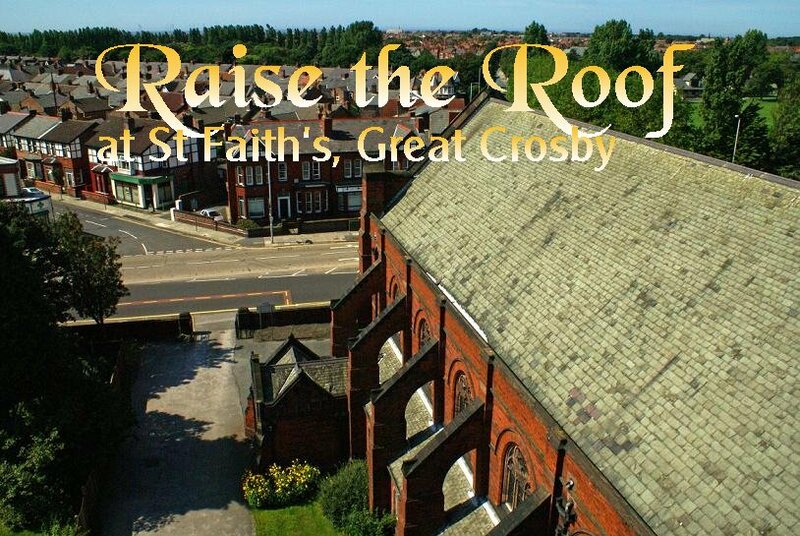 To make a larger donation, please make cheques payable to 'PCC St Faith Great Crosby' and send to our Treasurer, David Jones, marking the envelope 'roof fund'. Don't forget to Gift Aid your donation if you are a taxpayer. David's address is on the Directory page of this site. The Church Recipe Book, last printed in 2009, is being relaunched to raise money for the appeal. If you have any recipes you’d like included, please send them to Mary Crooke by email - jwcrooke@btinternet.com or hand them to her. 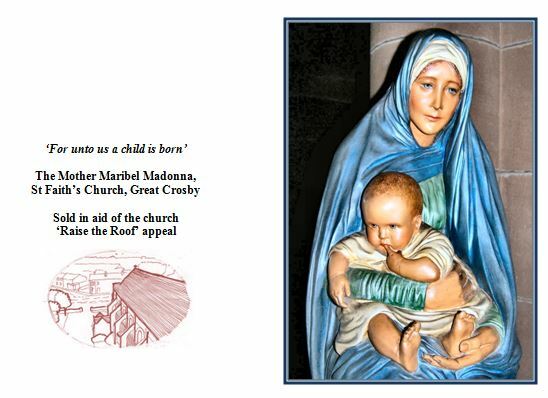 Church Christmas cards, featuring an attractive image of the 'rabbit madonna' in the Lady Chapel will be on sale before too long in aid of the roof appeal. We are hoping that music will form some of our fundraising for the roof. The three members of the National Youth Orchestra who gave a marvellous recital in July - Anna (clarinet), Eliza (cello) and James (piano) are giving a lunchtime recital in aid of the appeal on Saturday, 6th September. Details to follow. It's all beginning to happen - watch this space for further bulletins. Let’s Raise the Roof for St Faith’s! The temporary repairs are holding and the Church is watertight, though we are still roping off part of the South part of the nave as a precaution. Watch the website for updates on progress. In the meantime, the detailed quotations are in. The final bill, including the roof alarm and the repair to incidental damage, is just short of £27,000. 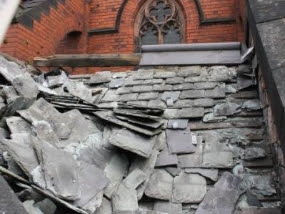 The insurance will only cover the first £5000 of damage, so we have already begun to fundraise to help us to repair this historic house of prayer so that we can continue to be the people of God and to reach out in mission and service to our parish. Rick Walker has made some plaques from the damaged slates – these are beautiful objects! Suggested contribution for one of these is £5. We have also received some substantial donations to get us on our way. If you are able to make a donation, please make cheques payable to ‘PCC of St Faith Great Crosby’ and send to David Jones (treasurer) and mark the envelope ‘roof fund.’ Don’t forget to Gift Aid if you are a taxpayer. 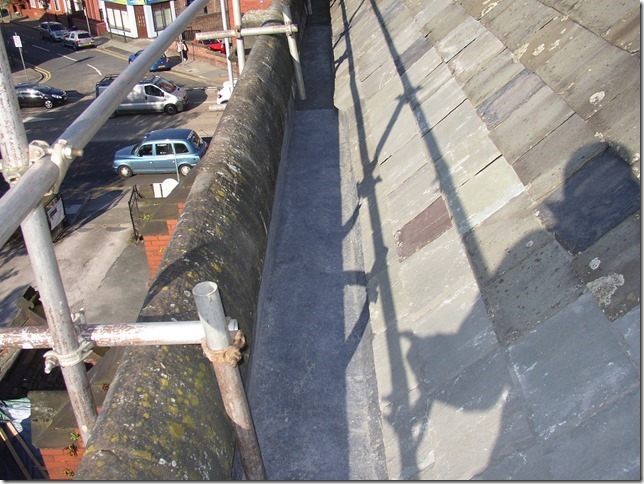 A large amount of lead was removed from our south porch and the south side of the main roof during the night of 14th/15th June, 2014 along with considerable damage to several hundred tiles and some rainwater gutters. 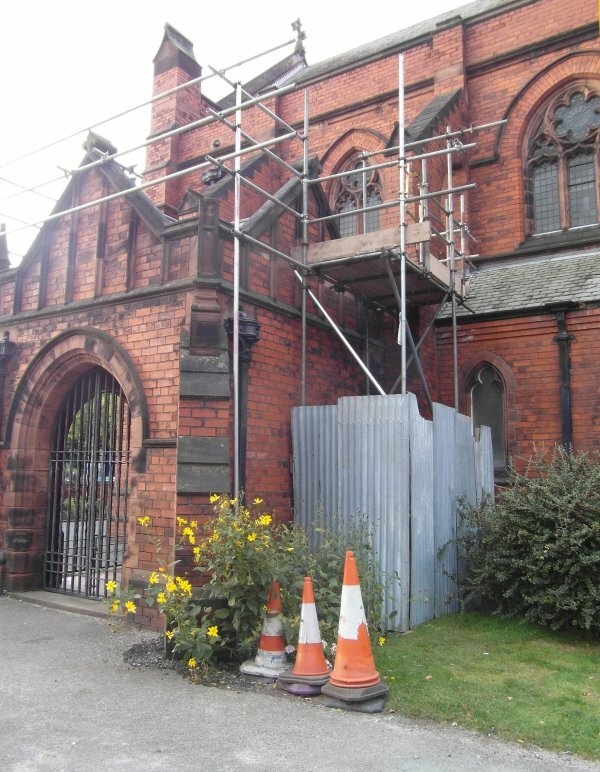 A temporary repair to make the church watertight was completed on Wednesday 2nd July. This should last for several months. 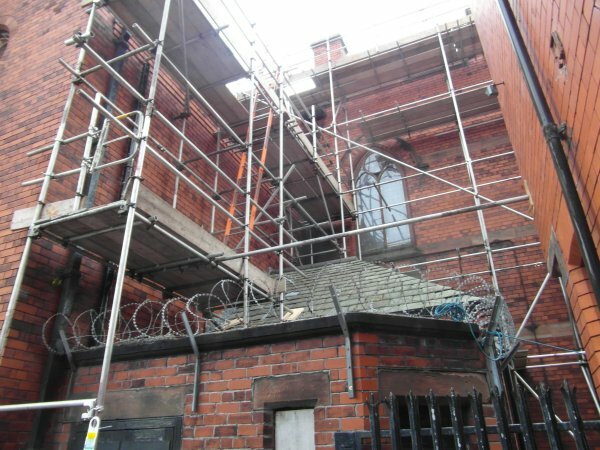 The scaffolding – properly protected from further unwanted ‘climbers’ – will remain up to allow us to get quotations for the permanent repair and for a roof alarm. Roof alarms are very effective – if it happened again and we had one, half of Crosby would know someone was on the roof – an excellent deterrent. Meanwhile, the Wardens and Sue, with support from the PCC and advice from the Archdeacon and Diocesan Heritage Support Officer (Ian Simpson) have asked our Quinquennial Architect Robbie Bell to project manage this work, because he has the professional expertise to ensure it is done to the highest possible standard. 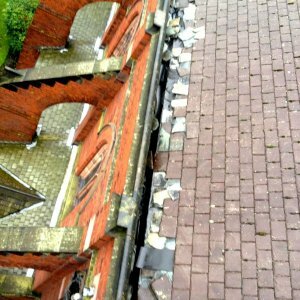 Robbie, with the various tendering contractors, is looking into the feasibility of using material other than lead for at least some of the repair – this should save some money and also is an additional deterrent – less metal to steal! Details about this will be part of Robbie’s presentation and final recommendation when the quotes come in. Sue and the Wardens have kept the Archdeacon of Liverpool in the picture about all of this – it is, quite simply, our duty to do so. 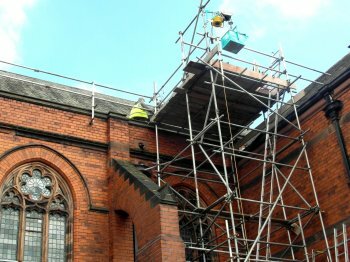 Archdeacon Ricky has agreed to write to the Diocesan Chancellor to grant us permission to get on with this work before the faculty process is completed – basically, because you can’t mess around with roofs! 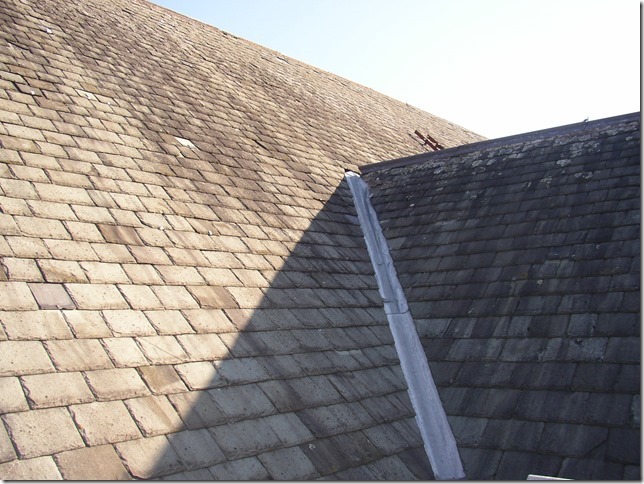 A lasting repair has to be done – if you lose the roof, you lose the building. No church is insured for metal theft for more than £5 000. This is because metal theft is considered ‘high risk’ for churches - so, as with any insurance, the insurance companies either put the premiums prohibitively high (in which case probably no church would bother!) – or limit the cover. This means that we will almost certainly need to fund some of the repair ourselves. We are not yet sure of the kind of sums that are likely to be necessary, however, Sue, the Wardens and the PCC have had to face the possibility that we do not have enough available capital to cover the cost. It is hard to put a sum on this until the detailed quotations and specifications have been received but we are likely to face a bill running into 5 figures. Sue has sought the advice of the Archdeacon and the Diocesan Secretary. If we cannot raise the capital in any other way, the procedure is that, through the Diocesan Board of Finance, we take out a loan which the Board of Finance then underwrites. This means that the Diocese takes on the RISK of the loan but the parish has the RESPONSIBILITY for paying it – it is a disciplined but generous way of approaching a difficult situation. Sue did ask about the possibility of a Parish Share holiday, but this is no longer a real option. If any parish does not pay its Parish Share, (i) it is itself made more vulnerable in terms of viability and (ii) the Deanery to which it belongs carries the cost – by losing some of its mission and growth budget. The PCC agreed to us investigating such a loan (not totally unanimously but with a very substantial majority), and Sue is in touch with the Diocesan Secretary (Mike Eastwood) and Finance Manager (Matt Elliot) about this. We have to look at this possibility, hard though it is, because, to emphasise, ‘to lose the roof is to lose the building.’ However, given that the LDBF is bearing the risk of the loan, if this is what it comes to, they will work with us to ensure we do not overstretch ourselves in this way. We do need to fundraise – not just for these repairs, but for work to the fabric of the building in general; however, we need to ensure the work is done as soon as possible, and this is putting in place the credit to do it – if we need to. It is ironic that the theft happened the very night of a PCC Away Day at which we discussed the fabric of the building. It was a positive discussion in that we acknowledged our excellent geographical situation, and our work with the community, particularly through the musical life of St Faith’s. 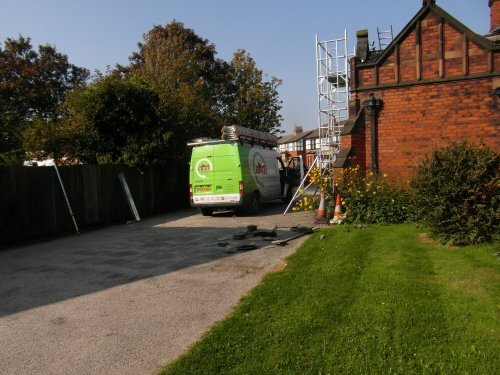 Ian Simpson had previously visited us, and we looked together at a number of possible developments to the building, including again looking at getting running water and a functional kitchen at the back of church, and having a more welcoming entrance. So, we are looking to ‘Raise the Roof’ – to launch a fundraising initiative not just for this repair but to improve the fabric of the building and to sustain its ministry and mission in the future. More details of this will follow. 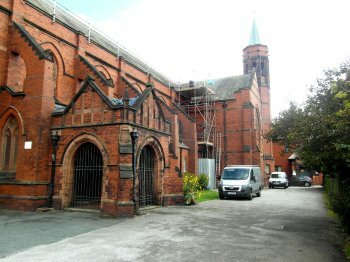 This is a challenging situation, thrust upon us and not of our own making; however, St Faith’s is a resourceful, creative and courageous community – and we will face this, with the help of God, in solidarity with one another, and mindful that our building allows us to play our role in the mission of the whole church – to worship God and serve our neighbours in this place. In the meantime, more information will be posted online as it becomes available – but please feel free to contact Sue or one of the Wardens it you want to know anything about this – we will do our best to keep you in the picture! 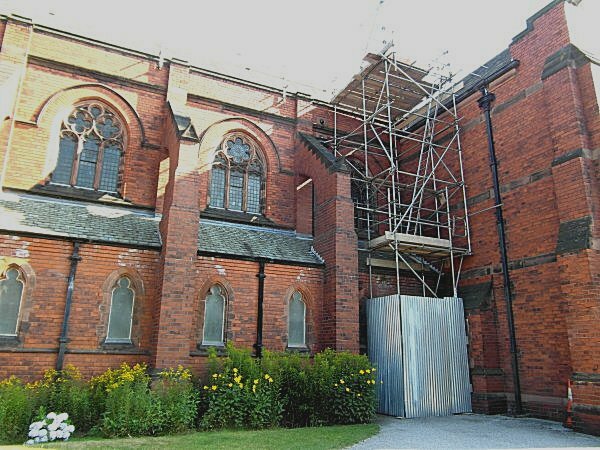 There will be a Q and A session about this after Church on Sunday 13th July, by which time, all the tendering for the repairs should be in, and a recommendation made about which to accept, and therefore we should have some final figures.